O Aldeamento da Prainha*** encontra-se localizado junto ao mar, estendendo-se por 35ha de áreas ajardinadas sobre a falésia, com acesso directo à belíssima Praia dos Três Irmãos, revelando-se o local ideal para férias em família, com os amigos ou para simplesmente relaxar. Spacious, comfortable and simply and elegantly furnished, the one-bedroom apartments are equipped with a living room with sofa bed, kitchenette or kitchen equipped with fridge, hob or oven, microwave, toaster, washing machine, bathroom, safe (extra-charge), cable TV and terrace, balcony or patio. Spacious, comfortable and simply and elegantly furnished, these apartments are equipped with 2 bedrooms, living room with sofa bed, complete kitchen with refrigerator, oven, washing machine, dishwasher, 2 bathrooms, safe (extra-charge), cable TV and terrace, balcony or patio. 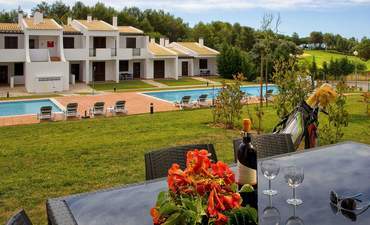 Spacious, comfortable and decorated to remind the Algarve tradition, these friendly villas are equipped with 2 bedrooms, living room with sofa bed, full kitchen with refrigerator, oven, washing machine, dishwasher, 2 bathrooms, Cable TV and terrace, balcony or patio. The Townhouses are fully equipped with air conditioning in bedrooms and living room, kitchen with washing machine and dishwasher, combined hob and oven, all utensils and equipments, LCD and DVD, Cable TV, two bedrooms with bathroom ensuite, one of the bedrooms has a double bed, social toilet on ground floor, and garden furniture. The outdoor parking in this area is common, but always guaranteed, given that it is an area with conditioned access by means of an electric barrier, to which only its users have access. Spacious, comfortable and simply and elegantly furnished, these villas have 3 bedrooms, and are equipped with a living room with sofa bed, complete kitchen with fridge, oven, washing machine, dishwasher, 2 bathrooms, safe, cable TV and terrace, balcony or patio. 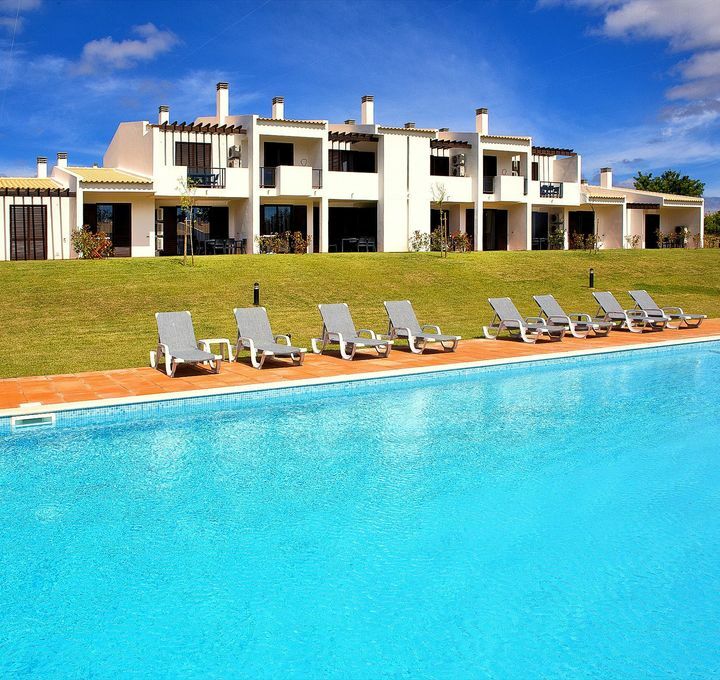 These villas date from the initial phase of Prainha and are located closer to the beach / pool access than the villas with private pool. 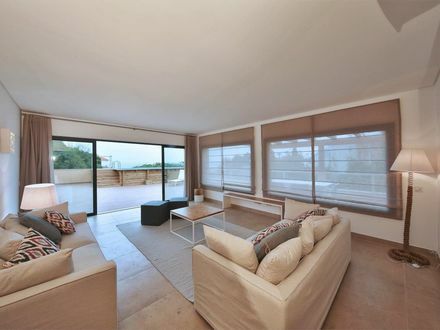 The villas with 3 bedrooms and private pool have modern decor with about 200 m2 on 2 floors. For your comfort these villas are equipped with fully equipped kitchen with hob, oven, microwave, toaster, coffee machine, washing machine and dishwasher, living room with LCD and DVD player, a bedroom with double bed and two with two single beds, 2 bathrooms - a complete and a social, air conditioning and heating system, garden with table and chairs. Parking guaranteed since access to this area is exclusive to customers / owners. 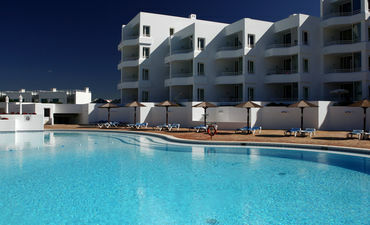 Fantastic new apartment, with quality finishes and very well equipped, with 2 bedrooms with 2 single beds, 2 bathrooms, spacious living room with view over the bay of Alvor, kitchen equipped with electric plate, oven, refrigerator, microwave, toaster, electric kettle, coffee machine, kitchen utensils, dishwasher and washing machine. On the outside terrace you have a private plunge pool where you can relax. 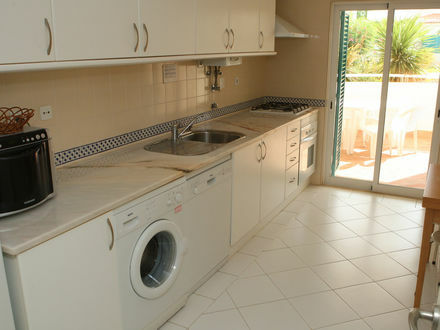 Elegantly decorated and air conditioned in the living room and bedrooms, this apartment also offers free wi fi access. 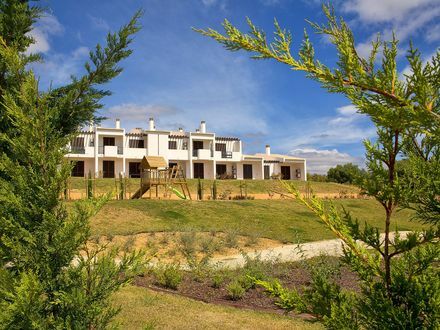 The villas with 4 bedrooms and private pool are villas with 3 floors, 240 m2, garden, built to high standards. 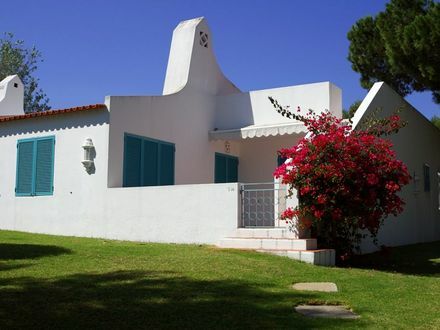 For your total comfort these houses have living room, 3 complete bathrooms and a social wc, fully equipped kitchen with hob, oven, microwave, toaster, coffee machine, washing machine and dishwasher, air conditioning and heating system , garden with table and chairs and private parking for two cars. 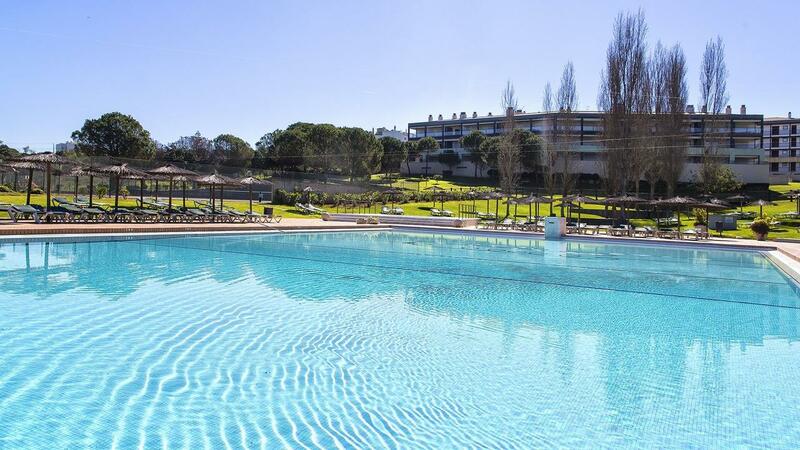 Gather your family and friends and come and enjoy the pool in the afternoon surrounded by good company! 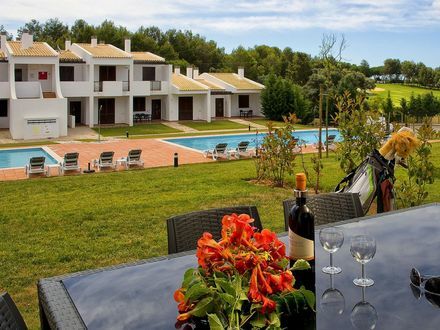 Located close to the famous village of Alvor and Alto golf course and only 5 minutes drive from the beach, the Alto Fairways complex consists of spacious and modern apartments with one (T1) or two bedrooms (T2), 2 swimming pools for adults and 2 for children and free parking (garage or outside). Spacious and comfortable, the 1-bedroom apartments (max. 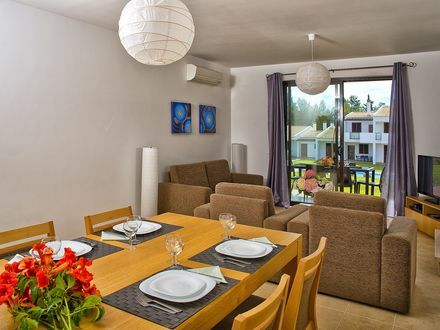 3 persons) of the Alto Fairways are equipped with 1 bedroom with 2 single beds, 2 bathrooms, one with bathtub and one with shower, living room with sofa bed , LCD and DVD and also kitchen with ceramic hob, oven, microwave, washing machine and dishwasher, refrigerator, extractor fan, magic wand and kettle. Living room and bedroom equipped with air conditioning. The apartments have also a small outdoor space. Spacious and comfortable, the 1 bedroom Apartments with pool view (max 3 persons) at Alto Fairways are equipped with 1 bedroom with twin beds, 2 bathrooms, one with bathtub and one with shower, living room with sofa bed , LCD and DVD and also kitchen with ceramic hob, oven, microwave, washing machine and dishwasher, refrigerator, extractor fan, magic wand and kettle. Living room and bedroom equipped with air conditioning. The apartment also has a small outdoor space. Spacious and comfortable, the 2 bedroom Apartments (max 5 persons) at Alto Fairways have 2 twin beds in each room, 2 bathrooms, one with bathtub and one with shower, living room with sofa bed, LCD and DVD and also kitchen with ceramic hob, oven, microwave, washing machine and dishwasher, refrigerator, extractor fan and kettle. 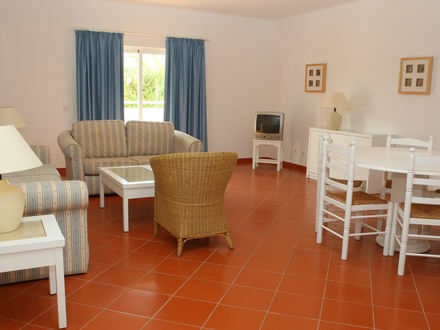 Room and rooms equipped with air conditioning. The apartment also has a small outdoor space. There are no extra beds. Spacious and comfortable, the 2 bedroom apartments with pool view (max 5 persons) at Alto Fairways have 2 twin beds in each room, 2 bathrooms, one with bathtub and one with shower, living room with sofa bed , LCD and DVD and also kitchen with ceramic hob, oven, microwave, washing machine and dishwasher, refrigerator, extractor fan, magic wand and kettle. 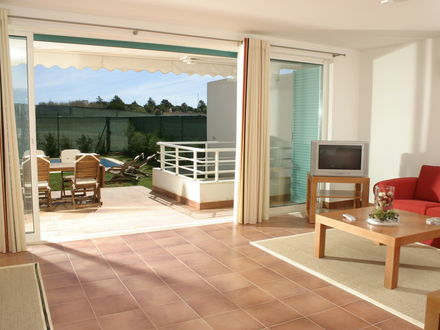 Room and rooms equipped with air conditioning. The apartment also has a small outdoor space. There are no extra beds. O Prainha Clube**** é um local especial, concebido especificamente para proporcionar a quem nos visita umas férias perfeitas. Estando integrado no Aldeamento Turístico da Prainha, oferece igualmente a possibilidade de desfrutar dos muitos serviços do complexo. The studios have 2 single beds, kitchen or kitchenette equipped with electric hob, microwave, electric kettle, coffee machine, fridge, crockery and cutlery, WC with bathtub, air conditioning, telephone with direct network, Cable TV, radio, Wi-Fi internet access, safe (extra charge) and a balcony or terrace with a pleasant view over the pool and Prainha Tourist Village. 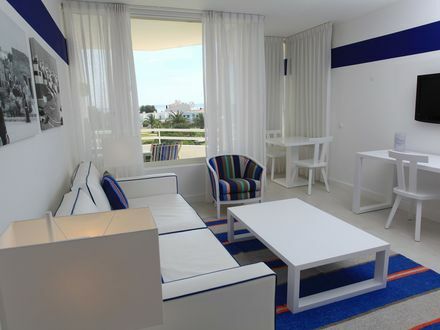 The decoration of the apartments can vary between Blue, White or Red. 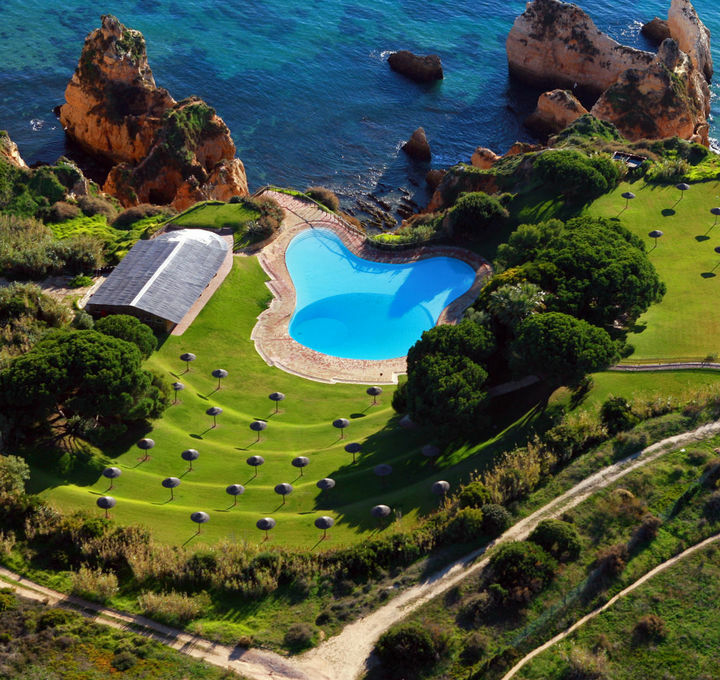 Prainha Clube guests have free access to the gym and Turkish bath at Aguadream Mediterranean Baths (closed on Sundays; minimum 18 years-old). The one bedroom apartments have 2 single beds and sofa bed in the living room, kitchen with electric hob, microwave, electric kettle, coffee machine, fridge, crockery and cutlery, WC with bathtub, air conditioning, telephone, safe (payable at the reception), cable TV, radio, wi fi internet access and balcony or terrace with a nice view over the pool and Prainha Tourist Village. 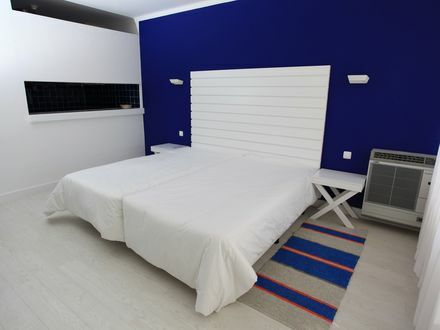 The decoration of the apartments can vary between blue, white or red. 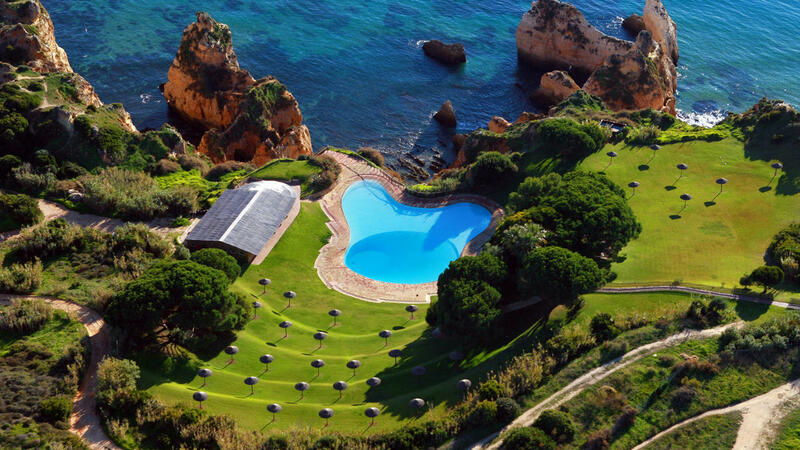 Prainha Clube guests have free access to the gym and Turkish bath at Aguadream Mediterranean Baths (closed on Sundays; minimum 18 years-old). The one bedroom apartments have 2 single beds and sofa bed in the living room, kitchen with electric plate, microwave, electric kettle, coffee machine, refrigerator, crockery and cutlery, WC with bathtub, air conditioning, telephone, safe (payable at the reception), cable TV, radio, wi-fi internet access and balcony or terrace with a pleasant view over the pool, Prainha Tourist Village and with the sea and bay of Alvor / Lagos in the background. 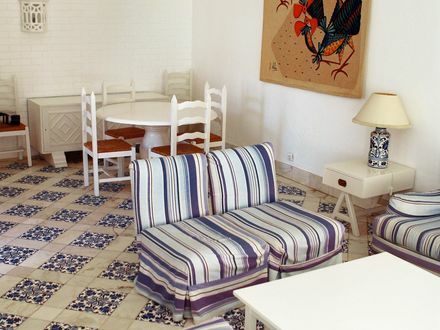 The decoration of the apartments can vary between blue, white or red. 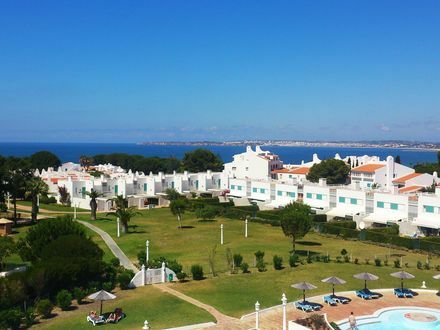 Prainha Clube guests have free access to the gym and Turkish bath at Aguadream Mediterranean Baths (closed on Sundays; minimum 18 years-old). The 2-bedroom apartments have 2 single beds in each one bedroom, kitchen or kitchenette equipped with 2 electric plates, microwave, electric kettle, coffee machine, refrigerator, crockery and cutlery, WC with bathtub, air conditioning, telephone with direct access, safe (payable at the reception), cable TV, radio, wi fi internet access and balcony or terrace with a nice view over the pool and Prainha Touristic Village. 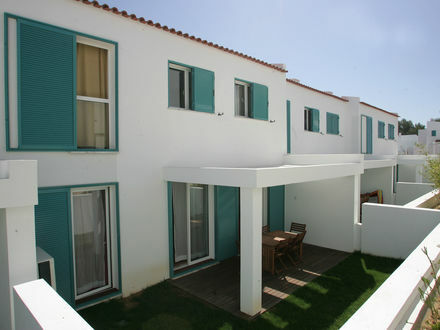 The decoration of the apartments can vary between Blue, White or Red. 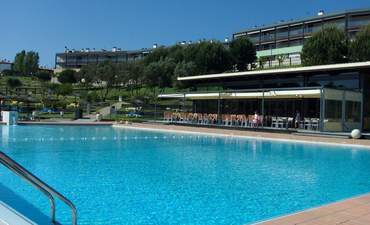 Prainha Clube guests have free access to the gym and Turkish bath at Aguadream Mediterranean Baths (closed on Sundays; minimum 18 years-old). Vitasol Park is located high above the Marina in the fascinating city of Lagos, providing unique views of the city, Meia Praia, Marina and the mountains. 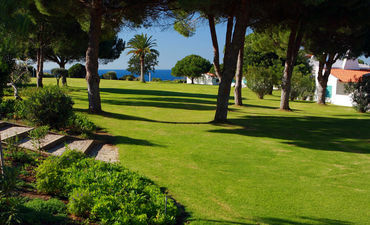 Surrounded by a lot of greenery and a cozy atmosphere, VitaSol Park is waiting for you for those relaxing holidays you deserve! The 1 bedroom apartments are equipped with 2 single beds, living room with sofa bed for two persons, kitchen or kitchnette equipped with electric plate, refrigerator, crockery and cutlery, toaster, washing machine, extractor fan, WC with bathtub, air conditioning, safe (payable at the reception), cable or satellite TV and balcony or terrace with a nice view over the pool, the city of Lagos or the mountains. The 2-bedroom apartments are equipped with 1 bedroom with double bed, and another bedroom with 2 single beds, living room with sofa bed for two persons, kitchen equipped with electric plate, refrigerator, crockery and cutlery toaster, washing machine and dishwasher, extractor fan, WC with bathtub, air conditioning, safe (payable at the reception), cable or satellite TV, radio and balcony or terrace with a nice view over the pool, the town of Lagos or the mountains. T3 apartments have three bedrooms, one with double bed, living room with sofa bed for two persons, kitchen equipped with electric plate, refrigerator, dishes and cutlery, toaster, washing machine, extractor, complete WC, air conditioning, safe (extra charged), cable or satellite TV and balcony or terrace with a pleasant view over the pool, the city of Lagos or the mountains. T4 apartments have four bedrooms, one with double bed, living room with sofa bed for two persons, kitchen equipped with electric plate, refrigerator, dishes and cutlery, toaster, washing machine, extractor, complete WC, air conditioning, safe (extra charged), cable or satellite TV and balcony or terrace with a pleasant view over the pool, the city of Lagos or the mountains.